The idea that directly observing gut microbes can give us insights into their behavior is an important part of the META centerâ€™s approach to microbiome research.This week, graduate student Matthew Jemielita with colleagues in the labs of two META PIs, Karen Guillemin and Raghuveer Parthasarathy, published a paper, Spatial and Temporal Features of the Growth of a Bacterial Species Colonizing the Zebrafish Gut, describing the growth behaviors of a very simple host-microbe system: a single bacterial species colonizing the larval zebrafish gut. Using light sheet fluorescence microscopy to obtain high-resolution, three-dimensional images over many-hour time spans, the authors were able to robustly measure for the first time microbial growth rates inside the gut of a live vertebrate. More surprisingly, they uncovered intriguing correlations between the morphology of the microbial communities and their growth behaviors, finding that densely clustered microbes grew at a much faster rate than did free individuals. The mathematical form of this growth reveals that the cluster growth is not occurring at the cluster surfaces (like the growth of a sugar crystal, or snowflake), but rather is a manifestation of increased cell division throughout the clusterâ€™s bulk. These experiments show that bacterial shape and form can be strongly linked to growth dynamics, and point the way to parameterizations that can characterize more complex multi-species colonization â€“ the subject of experiments presently underway. Matthew Jemielita, Michael J. Taormina, Adam R. Burns, Jennifer S. Hampton, Annah S. Rolig, Karen Guillemin, and Raghuveer Parthasarathy, â€œSpatial and Temporal Features of the Growth of a Bacterial Species Colonizing the Zebrafish Gut.â€ mBio. 5, e01751â€“14 (2014). 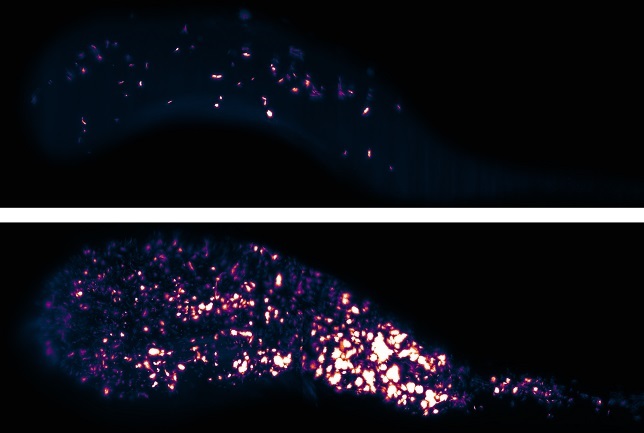 Figure Caption: Bacteria (false colored) in the gut of a live larval zebrafish. Each is a projection of a 3D image, part of a series capturing the first 16 hours of colonization of an initially empty intestine. Over this period a few intrepid individual bacteria divide into several thousand. These two images are separated in time by five hours.